They are professional astronomers who travel the globe to study distant galaxies, Earth-like planets around other solar systems and the primordial radiation left over from the “Big Bang,” the explosive beginning of the universe. But like the rest of us, seven physics professors from UC San Diego’s Center for Astrophysics and Space Sciences became amateur daytime sky watchers on Monday, flying to different states to experience firsthand the wonders of the first total eclipse in the United States since 1979. A solar eclipse occurs when the moon’s orbit lines up precisely between the sun and Earth, casting a shadow on the surface of our planet and revealing the sun’s corona—the outermost portion of its atmosphere. And this eclipse, as you could probably guess from the media hype, was a special event for several reasons. 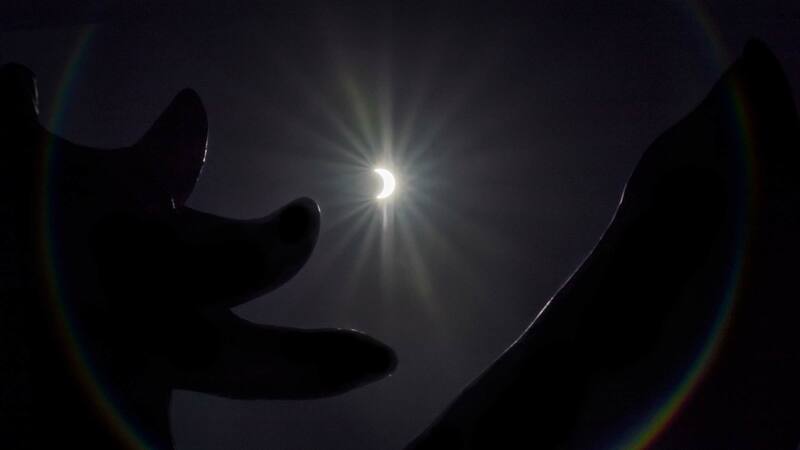 People across North America were able to see at least a partial eclipse of the sun, a little more, a little less, depending on where they lived. “Most astronomers were sufficiently obsessed with this event that we were driving, flying and crawling to the path of totality,” said Adam Burgasser, a professor of physics who was part of an international team of astrophysicists that recently discovered seven Earth-like planets orbiting a nearby dwarf star. In San Diego, where up to 58 percent of the sun was hidden behind the moon at the maximum point of the eclipse, low clouds that hugged the coast in the early morning gave way to clear skies. 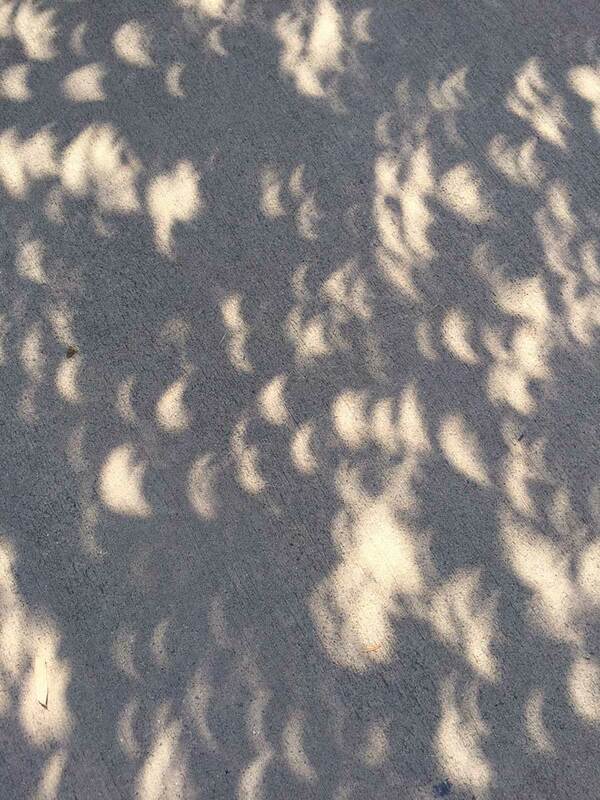 That allowed students and others who came to campus in the morning prepared with eclipse glasses, shadow boxes and pinholes in cardboard to watch the sun as it progressed during the eclipse to a crescent shape, which also could be seen on campus sidewalks as moon-blocked sunlight filtered between the leaves of trees. People watching the skies along a 70-mile-wide swath stretching across 12 states from Oregon to South Carolina—known as the “path of totality”—had an even more spectacular view of the event. They were treated, depending on their location, to totality for 30 seconds to a little more than two minutes. Billed as the first coast-to-coast total solar eclipse in the United States in 99 years, it was for many people, astronomers included, a once-in-a-lifetime event. For Brian Keating, a professor of physics who has been studying the primordial radiation from the Big Bang from telescopes in the Atacama Desert of Chile and the South Pole, watching the solar eclipse in the path of totality was an experience that viscerally tied him to his own astrophysical research. “Everything is connected,” he explained. “The Big Bang didn't make the sun, but it did make the elements that made the star that later exploded as a supernova. Material from that supernova made the elements that made the sun, and the Earth, and the moon. Burgasser packed up his bags last weekend and flew to Eastern Oregon to join a group of astronomers to watch the total eclipse. Because he wanted to travel light, he didn’t pack his solar telescope, but instead brought a pack of eclipse glasses to hand to people he met, courtesy of the American Astronomical Society. Oregon, which offered not only the easiest trip for San Diegans, but clear skies was also the destination for UC San Diego physics professors and astrophysicists Alison Coil, Quinn Konopacky, Tom Murphy, Karin Sandstrom and Shelley Wright. Despite the longer flight, Keating decided to make the cross-country trek to the last place in the United States in the path of totality for sentimental reasons.